Nine people, including seven children, were transported to a hospital for minor injuries after a collision involving Jefferson County Public Schools bus and a car. The accident took place at Brownsboro Road and Birchwood Avenue intersection around 8 a.m., according to Louisville Fire & Rescue spokesman Capt. Sal Melendez. Five students complained of minor injuries while two people, including the driver, suffered from serious but non-life threatening injuries. The two other children were also checked as a precaution. Students were discharged before noon from Kosair Children’s Hospital. Melendez suspects that the car was traveling east bound on Brownsboro when it collided with the bus, which was trying to make a left-hand turn onto Brownsboro road. He further stated that the police will consider the car's speed prior the accident. Large skid marks were seen on the roadway leading to the collision. The Louisville Metro Police Department conducted the investigation to find out who was at-fault. Melendez also shared he was uncertain whether the occupants of the green Mazda, the car that struck the bus, were wearing seat belts. They were brought to the University of Louisville Hospital. The vehicle had massive front end damage while the bus received little damage. 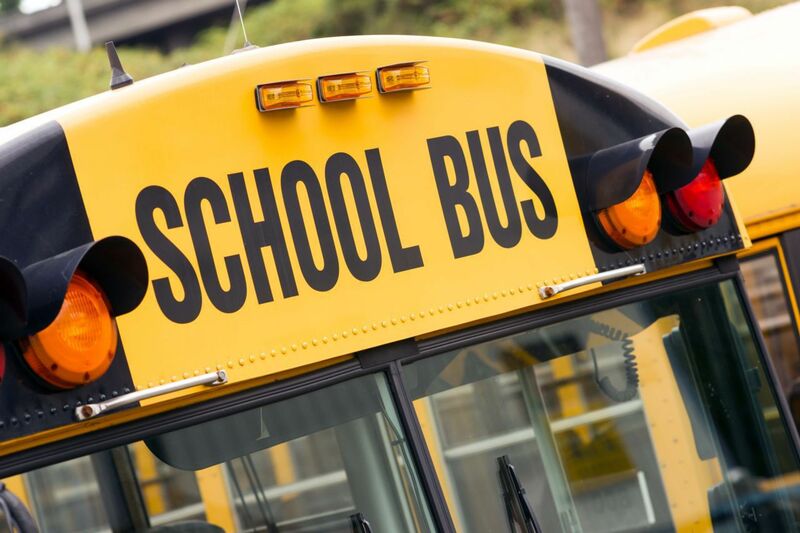 JCPS spokesman Ben Jackey explained that the bus was heading to a hub where students would transfer to buses going to Roosevelt-Perry, King and Atkinson elementary schools. "This isn’t the first," Jackey said, referencing to Metrosafe data. There were 250 accidents involving JCPS school buses in 2012 and 79 were due to the bus driver’s fault. This is not JCPS’ first time being involved in a collision. In June 2013, a bus carrying 41 passengers, 36 of whom were students, on a college campus visit went out of control and crashed on Kentucky Interstate 64 near the Jefferson-Shelby county line. Nearly three dozen people with various injuries were taken to hospitals. A month before that accident, a bus, this time carrying the Union County High School girls softball team, overturned in Western Kentucky. There were 28 people on board and 25 were taken to the hospital for non-life threatening injuries. In 2013, Kentucky also commemorates the 55th anniversary of the deadliest school bus crash in the nation. In February 28, 1958, a school bus en route to Prestonburg Elementary and High Schools collided with a tow truck. This caused the bus to plunge into the Big Sandy River. Twenty-seven people, including the driver, died. Some parents lost all their children. As a Kentucky Accident Attorney, I would like to remind drivers to always stop for school buses when it has its flashing light on. This is an indication that students are getting on or off the school bus. Also, bus drivers need to always pay attention to the road, never driver impaired and follow traffic laws. This will help ensure the safety of everyone on board.